What is ReadyChesco? ReadyChesco is a system that helps County and Township officials send emergency text alerts and voice calls to you quickly. ReadyChesco can send these to your cell phone, home phone, office phone, pager, and/or E-mail account. It is free to sign up for ReadyChesco, and you can choose the types of alerts you want to get. 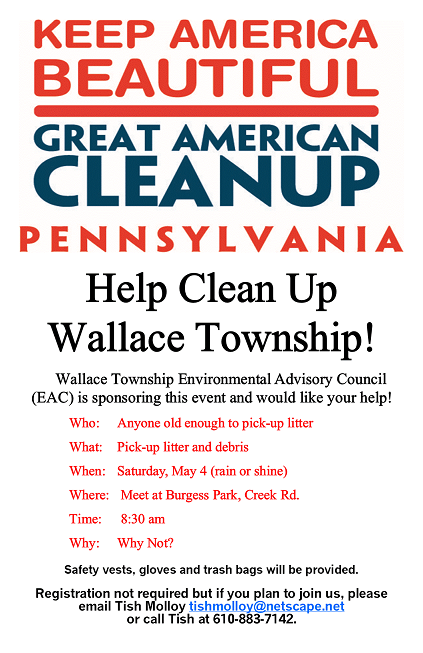 We strongly encourage all residents to sign up for Wallace township alerts on ReadyChesco.org today! · Register at SMART911.com – sign up to notify 911 responders to medical issues, pet information, special needs, etc. · Fill a plastic milk carton with water and put it in your freezer for a source of longer lasting “cold” if the electricity goes off. Use two and relocate one to your refrigerator to make food last longer. · Store bottled water, figure a gallon per day per person; don’t forget pets. · Buy extra non-perishable food you already eat; “rotate” food and water to avoid waste. · When notified of upcoming bad weather, fill your car with gas and your bathtub or kitchen pots with water so you can flush your toilet if you lose electricity. In January 2016, the Wallace and West Brandywine Supervisors were able to announce a joint agreement with regard to police services. In 2016, that agreement authorized West Brandywine Police Department to provide traffic enforcement in Wallace Township. In 2018, the Supervisors approved expanding WBPD’s role from just traffic enforcement to regular patrol hours. West Brandywine Police will now patrol Wallace 24/7. If you have an emergency, call 911 and the police force currently on duty will automatically be dispatched. For non emergency calls, you can contact West Brandywine Police Dept at 610-380-8201. No local property tax in Wallace Township. Wallace Township Resolution No. #2018-14, a Resolution establishing the Wallace Township Real Estate Tax for Calendar Year 2019, was passed at the December 20, 2018 BOS Meeting. This Resolution states that NO real property taxes will be imposed by Wallace Township pursuant to the official 2019 tax rates on real property within the Township.